Journalists from Germany’s biggest television networks were reportedly detained, questioned and not allowed to leave Qatar for days while working on a story about FIFA President Sepp Blatter and Doha’s vexed nomination for the 2022 football World Cup. Reporter from ARD German TV Florian Bauer tweeted that all of his, as well as colleagues’, materials for ARD and WDR networks have been erased and equipment destroyed. He and his colleagues were interrogated by the police as well as secret service, Bauer claimed, and were forced to stay in the country for days. 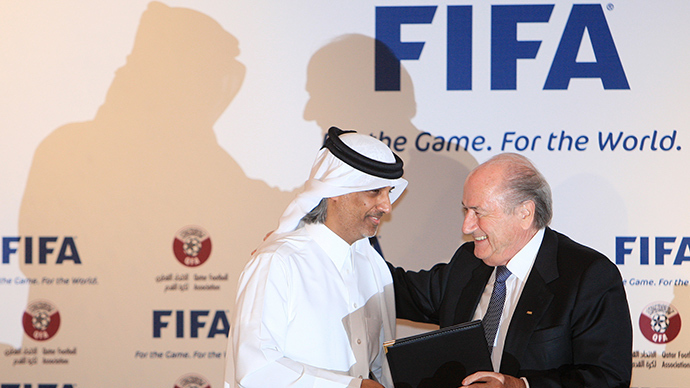 #Qatar2022 ahead of new criticism. Arrested in #Qatar, all material erased, equipment demolished. What is #fifa saying to this? Bauer, a long-time critic of the longtime FIFA president, has been working on a documentary titled ‘The Selling of Football: Sepp Blatter and the Power of FIFA,’ which was scheduled to air on Monday in Germany. Reporters employed by two German channels were shooting parts of the documentary when they were arrested. Now it's public. We got arrested in #Qatar, interrogated by the police&the intelligence service.Not allowed to leave the country for days. “[We were] arrested during a shooting with workers in the Qatari capital, Doha, then interrogated by the State Security … and only released after 14 hours. The WDR employees were not allowed to leave Qatar for five days. The camera equipment, laptops and personal mobile phones were confiscated and … returned only with a four-week delay. All data has been deleted and damaged pieces of equipment,” WDR’s team wrote. Based on the description of the documentary, the journalists managed to gain access to the bank of documents which incriminated key figures and could have potentially triggered their arrests. Both Qatar and FIFA have faced heavy criticism from human rights activists since the Gulf state was selected to host 2022 World Cup. Last year AFP reported that at least 237 Indian migrants lost their lives in Qatar in 2012 and another 218 in 2013. Some 400 Nepalese workers are believed to have died at building sites since construction for the World Cup 2022 got underway in 2010, according to the Guardian. These issues have raised serious eyebrows, with many rights campaigners speaking out against FIFA’s choice of Qatar as a host country. Activists have denounced the labor conditions in Qatar, labeling them a form of servitude and demanding immediate overhaul. Qatar currently employs the Kafala system to oversee its domestic migrant workforce. This requires that foreign workers be sponsored by an employer who’s responsible for their visa and legal status. There have been several reports that the system is being manipulated by employers, who are denying migrants’ wages and refusing to grant them an exit visa. On top of the labor criticism, Qatar has been accused of paying $5 million in bribes to win the World Cup bid. Senior football officials in Africa reportedly received the funds in return for making sure Qatar won the hosting position, according to Sunday Times revelations.